I’m a mouse stickler, and I’m hearting this new puppy. Picture turned out pretty well too. Obviously a mouse made exclusively for right-handed users. Yeah, my first asymmetrical mouse. 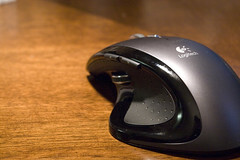 Logitech makes the MX610 in a left-handed version. It’s not nearly as cool though. The drivers are a little funky though (scroll wheel terribly slow last time I checked). I wish it had an extra button so I wouldn’t have to install the drivers. I would avoid installing the 2.1.3 logitech drivers — they casued severe problems on my iMac. I am using USB Overdrive instead, which is $20 shareware but so worth it.